In everyday practice, dentists usually are faced with challenging cases or specific patients’ questions and needs. With many updates in the dental field regarding new materials, products and latest dental procedures, dentists could not just refer to their college education to treat their patients. 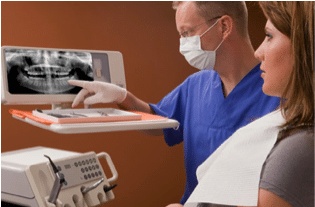 Along with our clinical expertise, it is essential to update our dental knowledge taking current evidence from different research in the field. Here comes a new approach to provide the best dental care to our patients which is the Evidence Based Dentistry (EBD). According to couple of studies about the attitude of practitioners towards the use of EBD and its application in Saudi Arabia, positive attitude observed; however, EBD has not been used to its maximum and many obstacles exist such as incomplete understanding of this approach, and lack of facilities and time to implement EBD into practice. Due to the priority of including EBD into clinical practice, dentists should have a good knowledge and training about it, either via online resources or live workshops. Some universities started to include EBD into their curriculum for undergraduate students. In this article, you will have an overview of what Evidence Based Dentistry means, its importance and elements. Also, personal reviews about helpful resources in EBD are included at the end for a thorough reference. Enjoy! In other words, it is a three part approach to making clinical decisions. 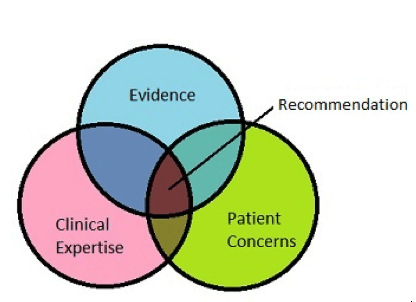 As it is shown in the picture, EBD is located in the center where all these three critical areas overlap: patients’ needs, the best evidence, and dentists’ clinical expertise . It is a personalized approach that starts with understanding the patients’ condition and preferences, and ends with them; performing the best treatment modality for their cases. 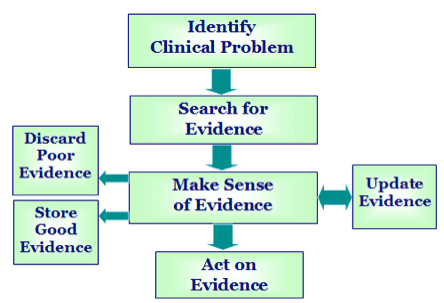 In between, critical evaluation of the best evidence is made to answer a specific clinical question. 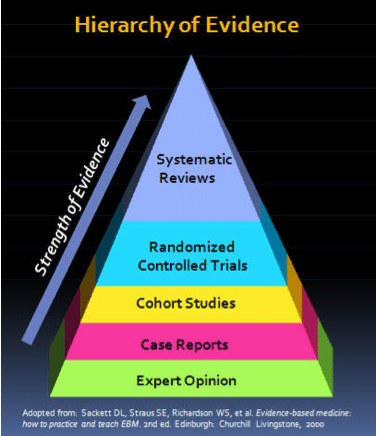 See the pyramid Above, the highest level is the Systematic Review of Randomized Clinical Trials and the lowest level is the Expert Opinion. The higher the level the less bias the study is and the stronger the evidence you get. [divider scroll_text=””] Why Need EBD? There is a huge gap between findings of different research projects and their application in the dental practice. EBD approach helps dentists to provide the best care for their patients based on current scientific information. Dental research is continually discovering improved treatment methods and therapies. Research findings are often delayed in being implemented into clinical practice. Dentists must stay current with changing therapies. Still EBD is a huge field to learn about and it requires critical thinking skills and experience to master its elements. It can also be a challenging task for busy dentists who do not have the time to search and evaluate myriad of studies to take the relevant information. That’s why EBD journals are being published and online sites are there that do the evidence evaluation part for us. They provide us with critical summaries and clinical recommendations to help us make clinical decisions, but keep in mind, EBD approach is not just taking the best evidence and applying it directly into the clinic. Evaluation of the evidence in relation to you patient condition and your clinical skills should be considered as well. You can start with the following links to have a good grasp of EBD approach. 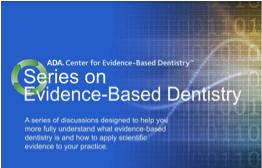 ADA’s Center for Evidence Based Dentistry Website, Which I highly recommend for dentists and patients as well. It is a well organized and user-friendly website. The center was established in 2007 with the vision of “disseminating the best available scientific information and helping practitioners implement it into clinical practice.” You can start with the Tutorial section to have more idea about EBD and take an overview of the website. The scientific information of the center is provided by a committee of EBD experts and ADA evidence reviewers. The major sections of the site include Systematic Reviews and Summaries, Clinical Recommendations, and Resources. The center also provides an opportunity to collaborate with the EBD team as a reviewer for special privileges through the Volunteer section. Link. patient condition. In addition to that, you can visit external sites via the Recourses section to learn more about EBD and how to apply it into your daily practice. In the Recourses, you can find links to organizations, journals, database to locate evidence, glossary, tutorials, etc. I recommend to go through the Tutorial section and start with the first website. It is a short introduction to EBD approach and how to formulate a clinical question. It is given in an interactive way by Boston University. Link. From my search about EBD in Saudi Arabia, I found this promising center from The Faculty of Dentistry at Umm Al-Qura University, Makkah. It is another useful EBD center settled on 2011. The site is directed to University staff, dentists and students with the purpose of helping practitioners use the best available evidence and apply it into clinical practice. The center major sections are DER Reports, Videos, and E-learning. Link. The DER Reports has database of variety of studies categorized according to the level of evidence. You can read summaries and clinical implications of myriad of current dental research and implement them into your practice. You can also share studies of interest with your colleagues via social networks. Moreover, you have the Videos section to learn more about EBD, and helpful slides in the E-Learning section. In the home page, you can keep yourself updated about upcoming events and workshops in Evidence-Based Dentistry given from different parts of the world.